Heart Stitches: Page 1 Finished! I finally finished page 1 of my HAED Colorful World!!!!! It took 53¼ hours spread out over 35 days - much longer than I had hoped. I was making good progress till I started the fundraising stuff at Alea's school (see previous post). This is what it will look like when finished - I hope! This is the front of page one. This is the back of page one. There are 24 pages total, but 4 of them are just narrow strips. At the rate I'm going it will take 2 years to finish. I just saw a pattern that said "She who dies with the most patterns isn't stitching fast enough" - I think that sums it up nicely LOL! I also got in a little painting last month - these are some polyresin bunnies I bought over a year ago & never finished - cute little babies! Next week I'll try to post pictures of Tall Sundae & Mermaid Heaven, my other 2 WIPs! 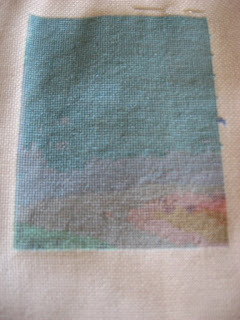 Until then, Happy Stitching & stay out of the mud - a sure sign that spring is on it's way! Great progress on your HEAD. The bunnies are cute. Your HAED will be very colorful when done, haven't seen that one before. Those bunnies are too cute. 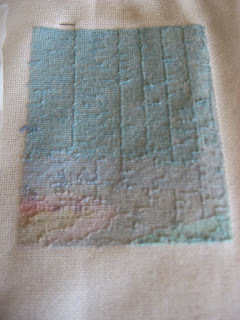 I think it is amazing you are finding time to stitch a HAED. Great work on the first page. What a beautiful design and you're making splendid progress on it! Lovely painting, too. Congrats on one page! I just started page 3 on mine. They do take several years to complete....if we keep working on them. Your HEAD looks fantastic. Cute bunnies. The HAED look really good. I just ordered my first HAED's and can't wait to get them. And you paint.....how nice! Great progress on your HAED. Cute bunnies. Congrats on page 1, and I love the bunnies. 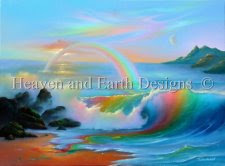 Jim Warren..one of my favourite designers.. Your HAED is coming along great. Don't get discouraged about it possibly taking 2 years to complete. I've never done one myself but from what I've heard, that is pretty normal. Even for fast stitchers. 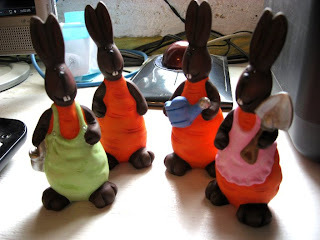 Your bunnies look like their real chocolate! !